Diaflux is a graphical workflow authoring plugin for KnowWE. It is used to model complex problems in an easy to read and understandable fashion. The Diaflux workflow may be edited using the Visual Editor. 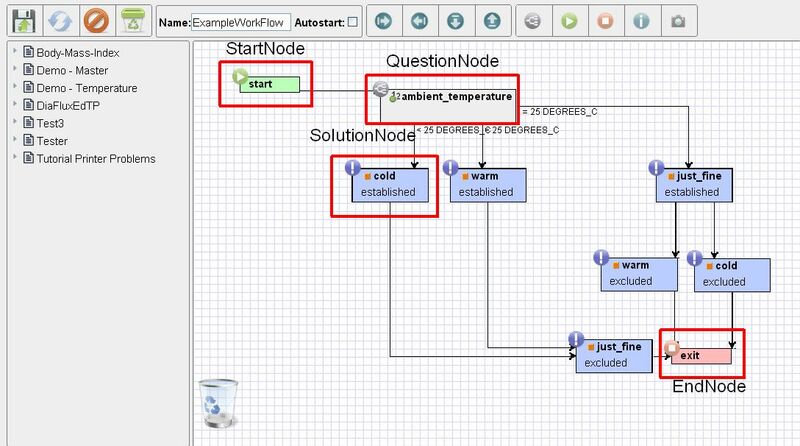 Action node: select a question, solution, or other flowchart and model an interaction with this it. Comment node: use this node to provide annotations to transitions or nodes. A DiaFlux flowchart shall have a unique name. Do not overload a single flowchart. Model rather small parts and reference them in a parent flowchart. Rule of thumb: Not more than a monitors field of view. Use commend nodes (light blue) to structure flows/arrows.